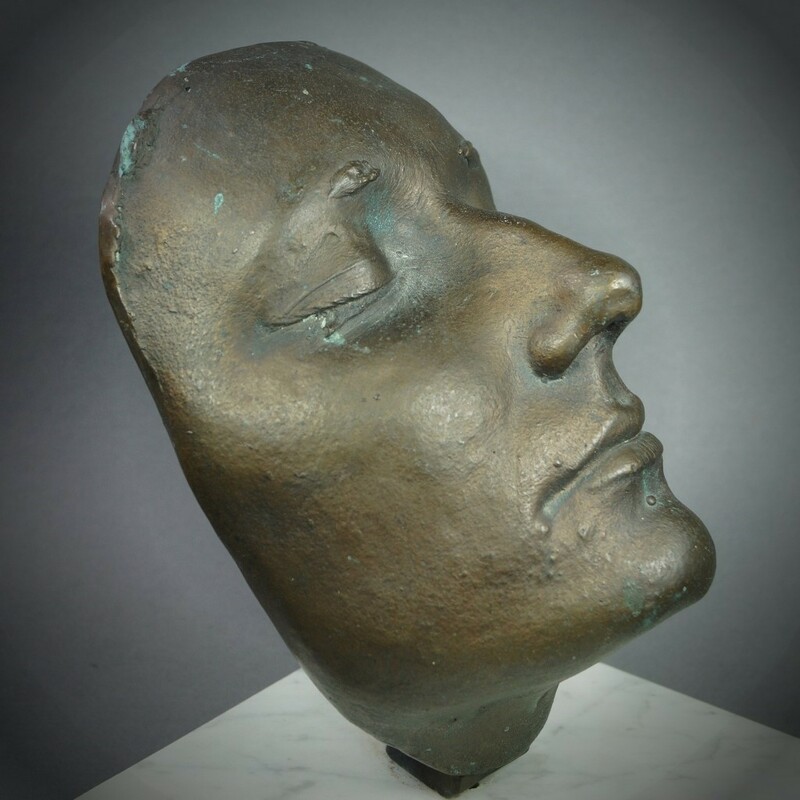 The bronze mask was given as a gift to Eva Chadwick by the British painter and sculptor Paul Wager (b 1949). Eva Chadwick is the widow of the celebrated British sculptor Lynn Chadwick, CBE RA. Paul Wager first worked with Lynn Chadwick in 1975 at Lypiatt Park, Gloucestershire, UK. Paul Wager’s most prominent pieces are found at Loughborough University, England. Paul Wager began teaching at the Cheltenham Art School in 1975, later teaching at the Winchester School of Art, Central St. Martins, Bristol Polytechnic and Loughborough University. Provenance: The piece was given as a gift from Paul to Eva when Paul was teaching foundry at the Cheltenham Art School. He had a business called Renaissance Life Casts where he made bronzes in the early 1980s. The model for the life mask was a pupil from the college. Eva Chadwick owned the piece for many years. The bronze is signed ‘RLC 80’ and is supported on a Carrara marble square marble base. Base measuring: Width 6.25 inch (16 cm) by depth 6.25 inch (16 cm). Base height 0.75 inch (2 cm). Face height 7.5 inch (19 cm). The bronze is in good condition, the marble base has some very minor nibbles to the corners. A small fixing hole partially visible to the marble base.